A Japanese Zero condenses the air off its wing tips as its pilot hauls his fighter inside a Marine F4F Wildcats determined attack. 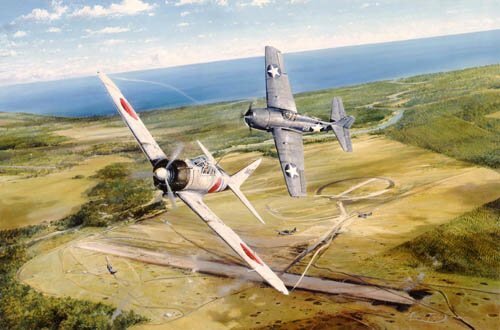 The two adversaries cavort the air in a desperate duel high over the island of Guadalcanal. The sky is alive with fighting aircraft as F4Fs and Zeros are locked in deadly combat. Below, clearly visible throught the clear tropical air is the prize over which they do battle: A single tiny airstrip on a small hill, humid, almost uninhabitable island - A priceless possession providing the key to air supremacy in the South Pacific.